This blog post is a riff off of a great one by Andy Kriebel that I finally made use of this week. Just like the process for exporting data into Excel from Tableau isn’t as easy as it should be, getting into the right browser editing view isn’t as simple as it should be either, especially for workbooks that contain more than a couple views. 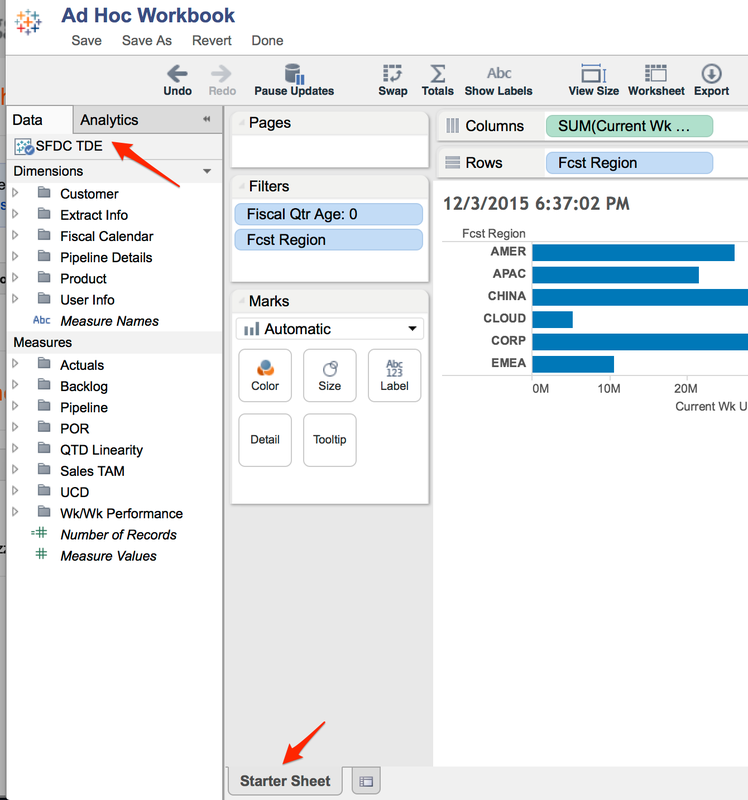 The user can click the small Edit link at the top of the view and Tableau opens up one of the sheets on the dashboard. While the size of the Edit link can sometimes be a problem (I’ve had a number of people say “Wow, I didn’t even see that there. That’s tiny.”), the bigger problem is that the user isn’t always taken to a logical “landing” sheet. My experience is that Tableau will open the first sheet on the dashboard, which is not always the ideal place for a user to land. For example, the first sheet might contain a chart type or table calculations that a novice user simply won’t know what to do with. And while they can right-click and select New Sheet or scroll across the tabs until they find a sheet they want to edit, why not have them land on a sheet that they can immediately start to work with? While a user can create a new sheet on the workbook we’ve published, the “baggage” associated with our workbook might get in their way. In particular, if we’ve created a bunch of calculated fields that are pretty specific in function (i.e. they were set up to facilitate one specific chart), these extra fields in the Dimension and Measures area make the data set seem more overwhelming than it should be. Additionally, if they choose to save their ad-hoc analysis, then their saved workbook will contain all of the original tabs as well unless they choose to delete all of them. While those additional tabs aren’t bad per se, if they don’t use them then why have them in their “personal” workbook? My solution to both of these leverages the same basic concept that Andy laid out in his blog post. Specifically, hijacking the Tableau URL to take the user exactly where you want them to go so they have a better overall experience. Next to the icon for the CSV download, I just added two additional images, one for editing an existing dashboard view and one for creating a brand new report leveraging the same data. 3. Right-click on each image and select Set URL. 4. For the Edit icon, I used the URL that Tableau generates when you click Edit (i.e. it places “authoring” after the domain name instead of “views”) and selected the name of the sheet I wanted the user to land on. 5. For the New Report icon, I also used the authoring URL but then pointed to another workbook on Server that uses the same TDE but only contains a single sheet in it (which I named “Starter Sheet”). This workbook has all of the same core data in the TDE that we use in the dashboard workbook, but doesn’t contain all of the extra fields and tabs. I know this could all be achieved via the API, but this solution requires no coding and noticeably improves the user experience. Thanks for reading, and definitely let me know if you have any questions about this solution or if you’ve come up with something even better.